As the webmaster for the IHS, I often am asked how to accomplish various tasks, such as updating a mailing address, or changing a password. I am of course happy to respond and try to help all members as much as possible. What I don't get enough of, though, is feedback about the site itself! If you have suggestions for features you would like to see, or complaints about a function not working as expected, please don't hesitate to contact me at manager@hornsociety.org. After being asked to make a video including a short lesson and some exercises for the E-News Letter of the IHS, I considered the options and quickly knew what specific topics I would like to share. 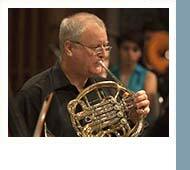 1) The position of the hand in the bell, which is very important to develop a very good sound. 2) The way and timing of breathing before a first note to play.In the second part of the video I will show you my warming up exercises. Warming up is a very important part of playing the horn. 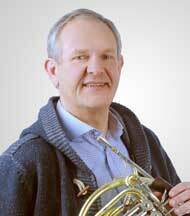 My warming up exercises are based on the basics of playing the horn: legato, scales, low register, high register, lip trills, long notes. But in a way that you never will hurt your embouchure. They take about 25 minutes. Try to do this early in the morning and you will feel fine for the whole day. Important is that you take a rest for at least 15 minutes after the warming up. You can download the scores of the exercises from my website: www.ab-koster.de. Go to “Teaching“, then you will find them under "Exercises." Hope you enjoy watching the video. 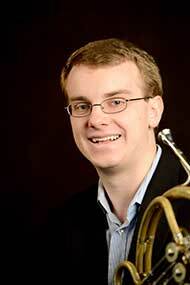 - What is the most challenging piece you have ever been asked to present in a solo competition? Othmar Schoek Concerto, which I had to play for the final rounds of both the Jeju International Brass Competition in Korea and the International Horn Competition of America just this past summer. I found the piece both very physically strenuous and musically awkward. It is a very difficult piece to sell to the audience in a convincing fashion and from a technical standpoint, it's very user-unfriendly. - How important a role does physical fitness play for you in your competition preparation? Do you run/swim/bike/do yoga etc.? Being in good physical shape is very important to my preparation. I find that what I eat really effects my ability to perform. I generally minimize consumption of alcohol, caffeine, salty foods, fatty/fried food, and sweets. Hydration is also a huge factor in my ability to play so I take extra precaution to stay hydrated, especially when traveling. Since I usually eat pretty healthy, I don't change my diet before an audition or competition. I'm not an exercise nut but I also make sure to stay active by walking and biking on a daily basis. I've competed in the IHCA three times (2009, 2011, and 2015) and each was a very different experience. My first time was the summer after I graduated high school so I didn't really have much of a preparation plan, I just practiced rather haphazardly, ran through the rep a bunch, and that was about it. The second time, when I won the University Division, I was about 1/3 of the way to developing what is my current competition preparation plan. I was more patient with my woodshedding, more disciplined at making sure I had a passage the way I wanted it before continuing, and recorded myself much more consistently. However, I still didn't really have a plan in terms of managing my time and keeping track of my preparation progress throughout the process. The final time, I had a complete preparation plan and a chart to keep track of my progress, which is the same thing I do in auditions. I had all my music divided up into sections and kept a detailed record of what I had worked on so I could see very simply how to best approach each practice session. I also relied much more on singing and mental practice instead of just beating my face up. 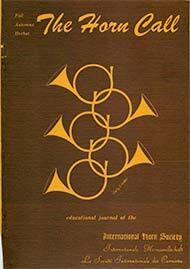 The complete archive of The Horn Call, from 1971 through the latest issue, is now avalable for IHS members to download from the IHS website!